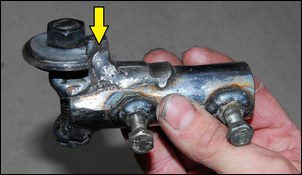 If you’re making your own intercooler plumbing, you’re sure to have come up against an obstacle – how to form the beads on the ends of the plumbing? You know – they’re the ones that stop the hoses blowing off under boost. Back in How to Weld Together Your Own Intercooler Plumbing we showed you how you could form lips in the end of the tube, using wire and welding the lip into place. 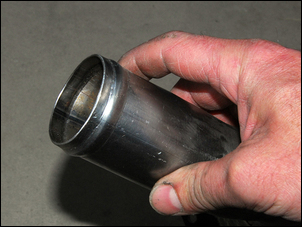 There is – make your own intercooler pipe beader. You’ll need a welder, a hydraulic press and some bits and pieces of steel. 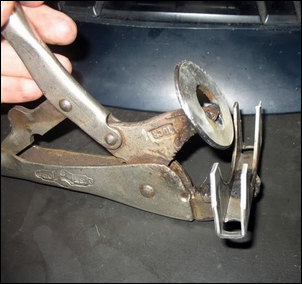 If you look around the web, you’ll find lots of people have made their own tube beader using a pair of multigrips (or big pliers), a washer and half a muffler clamp. 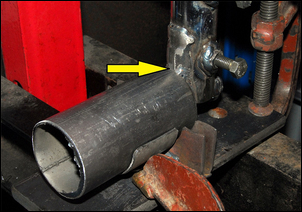 The multigrips are used to push the washer into the inner wall of the pipe, with the outer wall supported by the bottom half of the muffler clamp. A depression is made, then the tube is rotated and another made. It’s a great DIY approach – but for one problem. The physical effort is high, even for aluminium tubing. For steel, or even more so, stainless steel, the effort is too great – these materials need much more force than just hand strength. But the fundamental approach is great – so how to give it more muscle? 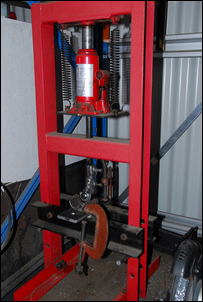 The answer is to use a hydraulic press – we used a 6 tonne design. The press allows you to form the bead with much less effort, and to form it in stronger materials than aluminium. 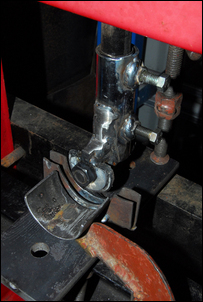 However, with the power of a press behind it, the tool needs to be very stiff – so a new design is needed. The starting point is to select a thick steel washer just a little smaller in diameter than the internal diameter of the pipe you’ll be working with. Our requirement was to work with 2 inch steel tube, so the selected washer had to be a little less than 2 inches in diameter. 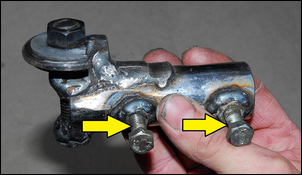 Don’t use a thin ‘mudguard’ washer – it will bend under the forces involved. The washer we used was 4.5mm in thickness. Grind or file the sharp corner edges off the washer. If you can stiffen the thick washer by placing thinner, smaller diameter washers either side of it – great. 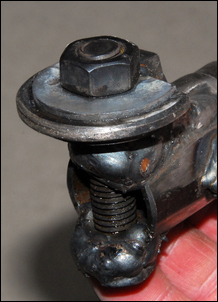 Select a high tensile bolt and use two nuts to attach the washers at the end of the bolt. We then chose to cut off the top half of the washers. Grab some thick-wall tube that the shaft of the press will just slide into. File a depression across the end of the tube that the bolt (complete with attached washer) will fit into, then weld the bolt to the tube. Add a gusset (arrowed) to stiffen the bolt against bending, while still leaving clearance for the tube to fit sufficiently over the washer that the bead will be formed a little in from the end of the tube. Make this assembly as stiff as possible. The first one we built – just quickly to see if the approach would work – used the bolt without the gusset, but once placed in the press, the bolt quickly bent. 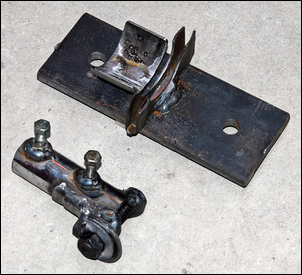 Two nuts were welded over holes in the tube to allow the assembly to be clamped to the press’s shaft. Now for the other half. 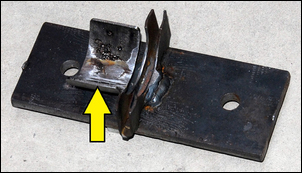 Weld the bottom part of a muffler clamp to some thick steel plate that can be clamped in the press. Easy, huh? However, again the quick and dirty prototype showed a problem – it was hard to keep the tube square to the base and so the lip tended to wander around rather than being in a straight circumferential line. 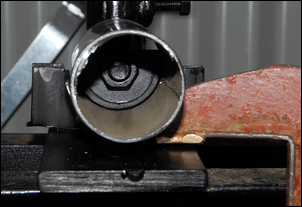 This problem was overcome by placing a half-round piece of slightly larger pipe (arrowed) in line with the clamp, so keeping the tube square. Clamp the bottom assembly to the press. Insert the top assembly on the shaft and then operate the press so that the washer lowers into the lower clamp piece. Then, with the alignment correct, tighten the bolts that hold the upper piece to the shaft. Insert a trial piece of tube. The tube should be inserted sufficiently far that it is just touching the gusset (arrowed). This sets the distance that the bead is formed from the end of the tube. Operate the press until the washer is firmly against the inner wall of the tube and then cycle the pump a designated number of strokes. We found that on the press we were using, two strokes of the pump formed a bead of the correct height. Release the pressure, rotate the tube about one-eighth of a turn, check that the end of the tube end is just touching the gusset, then perform the same operation. Continue until the bead is fully formed. The finished tool will make straight and even beads in minutes. We had all the bits lying around, so the out of pocket cost of the tool was a grand zero!